Japanese banks work similarly to banks all over the word. There are lots of large international banks as smaller regional ones. The large local banks include Postal Bank, Sumitomo, Tokyo-Mitsubishi UFJ, Mizuho, Citibank and Aozora Bank. Several internet banks, for example Seven Bank, gained its popularity offering their clients services via internet or automated teller machines. Banks offer to their customer’s lots of services such as money transfers, withdrawals, deposits, currency exchange and investment. Normally banks are open from 9 am. to 3 pm. and close on weekends and national holidays. Automated teller machines tend to have longer operating hours and tend to be available on weekends and holidays. An increasing number of automated teller machines are available 24 hours. Aozora Bank, provides different services to financial institutional, corporate and retail clients in Japan and internationally. Offering loans, deposits, syndicated loan arrangements, derivative products, acquisition and project financing and other financial products comprising private placement bonds, trustee services, and merger and acquisition advisory services to large and medium-sized corporations, the public sector, and financial institutions. 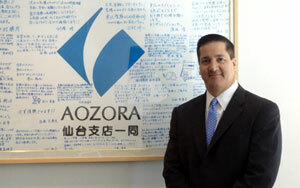 As of 30th of June 2012, Aozora Bank operated 20 branches in Japan and 2 representative offices internationally. President Brian F Prince started work in Aozora Bank in 2008 as chief operating-investment officer and deputy president with recognized expertise in the banking and financial industry of Japan. In 2009, Brian F. Prince was appointed acting president, acting chief executive officer (CEO) and executive officer. In the same year Mr. Prince was named chief executive officer and president of Aozora Bank. Residents and tourist can open a bank account in Japan bank if they have a resident card. Some banks accept a Japanese driver's license. More strict banks may also need a personal stamp. Most banks do not ask a maximum deposit to open an account also do not charge a fee for maintenance. Interest on standart accounts are low, often fractions of a percent. One time you have applied, your bank book and credit or debit card will be sent by regular mail. You can close your bank account personally at any branch presenting your resident card, bank book, credit/debit card and if necessary inkan (personal stamp). Electronic bank transfers are one of the key services offered by Japanese banks. It’s a very common way for individuals and businesses to transfer money and to pay bills. Transfers can be made at the teller, automated teller machines (ATM) or via the internet, all transfers made within business hours processing on the same day. A charge normally is from 150 to 600 yen (paying sender). It is also always possible to transfer money from outside of Japan to a Japanese bank account via wire transfer; but it somewhat complicated and exspensiv process. 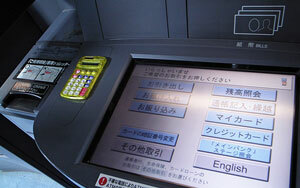 Japanese ATMs allow their users to withdraw, deposit and transfer money, as well as update their bank books. Most ATMs is open during business hours, but you easily can find 24hours ATMs. Many of automated teller machines not accept foreign issued credit and debit cards. Credit cards are widely accepted at restaurants, shops and hotels across country but not as popular as cash. Residents of Japan can apply for credit/debit cards such as AMEX, MasterCard, VISA, or/and JCB in Japanese banks or other institutions. Approval process is relatively strict, and without permanent residence or tax history in Japan may be difficult to get bank card. Japanese banks offer mortgages and loans at low interest; but they can be difficult to secure. Besides requiring the applicants to have a minimum accepted by bank income level, most banks will issue loans and mortgages only to Japanese citizens, foreigners with a Japanese spouse or permanent residents.